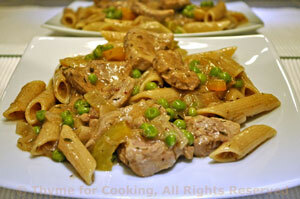 Pork with Peas and Pasta, quick, easy dinner recipes. As usual, a simple, one-dish dinner to end the week. Pork tenderloin can be cooked quickly while remaining tender. With frozen peas, this dish goes together quickly. Cook pasta according to package directions. Drain. Slice pork into rounds about 1/2" (1cm) thick. Roughly chop shallots and pepper. Heat oil in large nonstick skillet. Add cumin, paprika, shallots, pepper, and sauté until tender, about 5 minutes. Move vegetables to the side, add pork slices and sauté 3 - 4 minutes per side. Add peas (no need to thaw first) thyme, mustard, beef stock, cover, reduce heat to low and simmer 10 minutes. Dissolve cornstarch in water, add to skillet and stir until thickened. Add pasta to skillet, stir well to combine and serve.